At last, my own personal home page. I was first introduced to computers in 1995. As more and more url's began appearing for products on TV, I felt as though something big was going on and I was missing it. I purchased a IBM Aptiva just before Christmas of that year and I've been in love with the darn thing ever since. When I'm not online, I'm taking care of my 5 cats. My husband, kids and myself recently moved into our own home. Before that I was renting and the number one rule there was"NO PETS!" You could be a drug dealer and they didn't say anything, but have a cat and the eviction notice was in the mail. Somehow we manage to conceal 3 cats...all strays that came to us in various stages of injury and disease...for nearly 4 years. But in March of '97 our luck ran out and we were turned in by who knows who. It was then we started to seriously look for a house and found a lovely 7 room ranch about 20 miles south of Boston, MA. 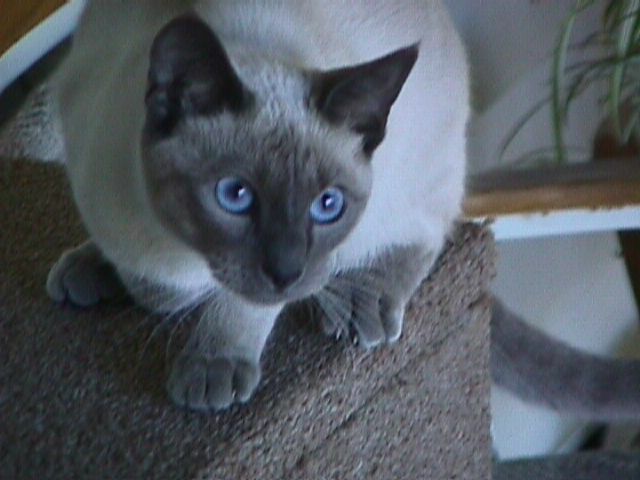 In July of '97 I added two beautiful and sweet Siamese kittens to the group. All of the kitties get along splendidly and there is never a dull moment. The picture is of Mollie, our Blue Point Siamese. This many people have done the impossible and found this site! Impressive! Believe It Or Not... Chester The Cat and Gemi, The Little Kitten, Will Be Appearing Soon! Some Disney World Special Effects Provided By Mother Nature. OK, I admit it. I'm a Disney World Junkie. I made my first trip to WDW in 1986 and I've been back there 6 times to enjoy the magic over and over. Although every trip has been special in it's own way, here are some of the more memorable moments from trips 1-4. Trip #1, 1986: Trying to see all and do all in 5 days. Not a good idea as it leaves you with a sense of unreality and total exhaustion. Trip #2, 1990: Having absolutly no memory of Trip #1 due to extreme fatigue, this was like my first real trip there. Stayed on site this time in a Fort Wilderness trailor. MGM had just opened. Trip #3, 1992: Stayed at Fort Wilderness again for the second and last time. We had some unexpected house guests of the creepy, crawly variety. I decided to stay in a regular hotel the next time if I was going to be there in the summer. We had an armadillo that attempted to get into the trailer. Funny now but not so much then. During this visit, I had the best of all my experiences at WDW. One night, while we were at EPCOT, a thunderstorm blew up. I was standing in front of the the musical fountain and the music started and the thunderstorm really got it's act together. Suddenly, it began pouring! The lightning was flashing! The thunder was enormous! It was a sensory overload! I looked behind me to see how all the other people were enjoying this spectacle and there was no one there but me!! It was about as close as you can ever come at WDW to having the park all to yourself. Trip #4, 1994: This time we went to the Port Orleans Resort. Fabulous! They have a wonderfully themed pool. It looks like a dragon and there's a slide inside the dragon's head for the young and the young at heart, like myself, to play on. As you are probably figuring out by now, I'm also a weather fan...especially concerning thunderstorms. One day while I was back at the hotel we had a very active lightning producing storm come by. Along with 5 or 6 other people, I was outside video taping the action. Through sheer luck, I had my camera pointed at just the right place, at just the right moment and got the picture you see here. Because of the wonderful Snappy program, I was able to make a photo out of this once in a life time event. More Confessions of a Disney World Junkie. 1996, Trip #5 Report. Some Cool Links Are Here.